Anonymous has been in a cyber war with the group since protests in Ferguson, Missouri last year. File photo of a Ku Klux Klan cross burning. HACKER GROUP ANONYMOUS is planning to reveal the identities of up to 1,000 Ku Klux Klan members, the latest twist in an ongoing cyber-war against the white supremacist group. In Twitter messages and a YouTube video, the hacktivist collective said it had obtained the list of names after accessing the Twitter account of a clan member. “All will be revealed next month around the one year anniversary of #OpKKK,” it tweeted, under the handle @Operation_KKK. Anonymous took action against the Klan on 16 November last year after members of the group threatened violence against peaceful protesters in Ferguson, Missouri. In a statement earlier this week, Anonymous said it felt justified in “applying transparency” to the KKK. You are abhorrent. Criminal. You are more than extremists. You are more than a hate group. You operate much more like terrorists and you should be recognized as such. You are terrorists that hide your identities beneath sheets and infiltrate society on every level. The privacy of the Ku Klux Klan no longer exists in cyberspace. You’ve had blood on your hands for nearly 200 years. We will release, to the global public, the identities of up to 1,000 Klan members, Ghoul Squad affiliates and other close associates of various factions of the Ku Klux Klan across the United States. 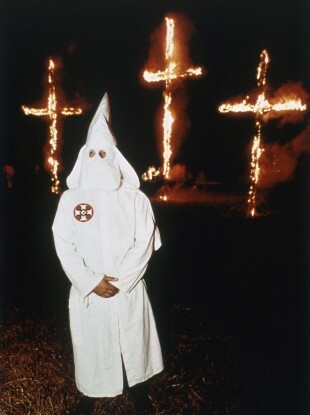 Email “Hacker group Anonymous is about to expose 1,000 Ku Klux Klan members”. Feedback on “Hacker group Anonymous is about to expose 1,000 Ku Klux Klan members”.